We're all like detectives in life. There's something at the end of the trail that we're all looking for. Last Friday I went for a run down by the Yukon River. 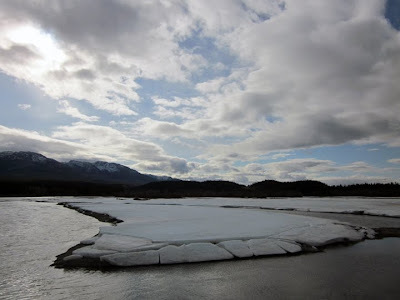 It has been just over two weeks since I arrived in Whitehorse. Most days have been clear and sunny, or the occasional clouding over which has lent a lovely atmosphere with the mountains off in the distance. 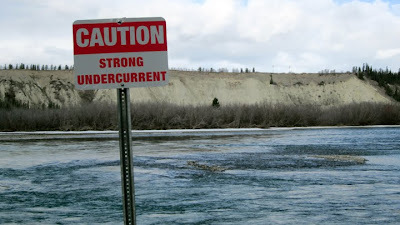 Admittedly I'm a cautious girl, despite traipsing off and hiking alone in Alaska this past weekend (that will be another post, another day :)). Thus when my friend Ian told me about a great loop to run down by the river I was excited and scheduled it in as an alternate to my usual route down Hamilton Blvd to the Canada Games Centre and back (about 4.5km). This loop by the river is about 5km. 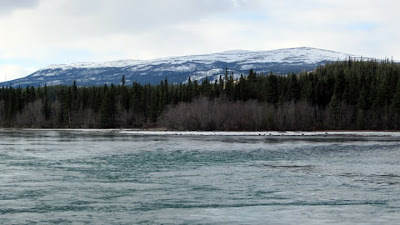 Thus I headed down and parked near the S.S. Klondike, a designated national historic site which is situated right at the river on the way into town. It was brisk at 9am on Friday morning. Granted it WAS a workday. Nevertheless I was astonished at how few people I saw on the trail. In fact, aside from maybe two other joggers and one man walking his dog, I saw no one for the entire loop...It was alternately peaceful and unnerving. I was raised in the suburbs...a town that is home to 155,000 people. I'm still trying to wrap my mind around the capital city of The Yukon Territory only having 25,000 people. Once you leave Whitehorse the average settlement that you encounter is only home to about 300-800 people...as another example, there are about 700,000 people in Mississauga, a suburb of Toronto that is two cities over from Burlington where I live. That is the ENTIRE population of Alaska contained within Mississauga essentially. Wow. The patterns of ice were so beautiful, I was quite hypnotized by them. Ian had informed me that there was a bridge called the "fish ladder"that crossed the river some distance down the trail. 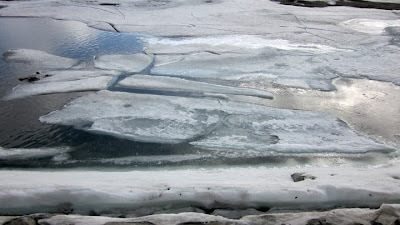 Thus I set off along the asphalt and stopped periodically to take photos of the melting ice on the river. The last time I saw this river was in Alaska...it certainly has personality...clear waters that vary from teal to slate blue-gray....it ranges from over a hundred feet across to narrower channels but always, always is on the move. I was glad I had my toque with me as I skirted the river and paralleled Robert Service way, one of the main thoroughfares into the city. Even so there were not many cars going by (surprise). Here is a short video that I shot while running along the river. As I made my way around the loop I encountered a small wooden bridge. Not knowing the area I presumed that this was the bridge Ian referred to. I was wrong. The asphalt turned into wood chips and soft earth but I kept running, happy to have a change of surface. 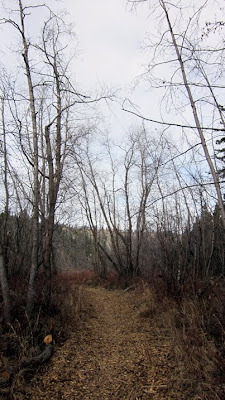 The trail became quite overgrown in parts and I had the feeling that I had taken a wrong turn but kept on with the route. Finally I realized that indeed I was going the wrong way. Serendipitously, just at that moment another runner came by. I asked her where the elusive fish ladder was and she instructed me to where I would find it. A few minutes later and I was on track again. The fish ladder is right at the hydro station in Whitehorse. Signs posted everywhere indicated how hazardous the area was so needless to say I hastily ran over the bridge and made my way along the far shore in the direction of the start of the loop. 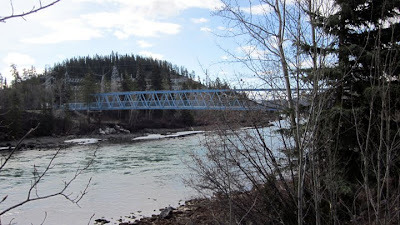 The fish ladder bridge that crosses the Yukon River. A nice 5 km loop. I have not run inside at the Canada Games Centre since arriving in Whitehorse. Generally it is easier on the knees to run on a treadmill than paved surfaces. Concrete is the bane of runners' knees. Asphalt is 10 times softer apparently and you can definitely feel the difference between the two. 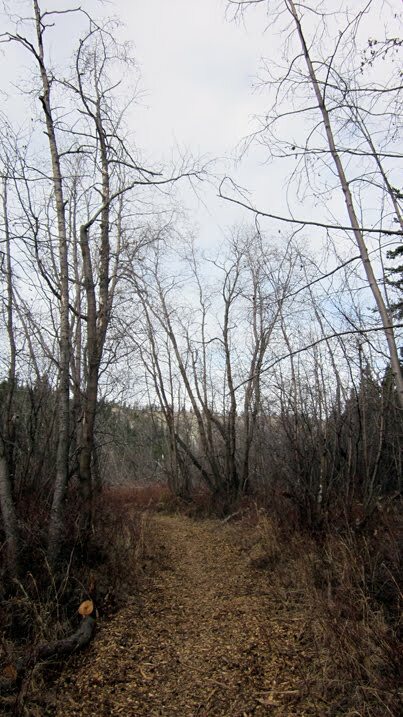 However here the natural trails are so ubiquitous and inviting that I would almost feel guilty running inside. Thus I cherish the fresh air and ability to run outside here. The trails on the far side of the river veered off of the asphalt and I followed them, the soft ground being the most preferable for my feet and knees. Periodically I stopped to take shots of the river, signs and landscape. My memory of the entire experience is clean, fresh, cool air, adventure and the excitement of taking a new path. 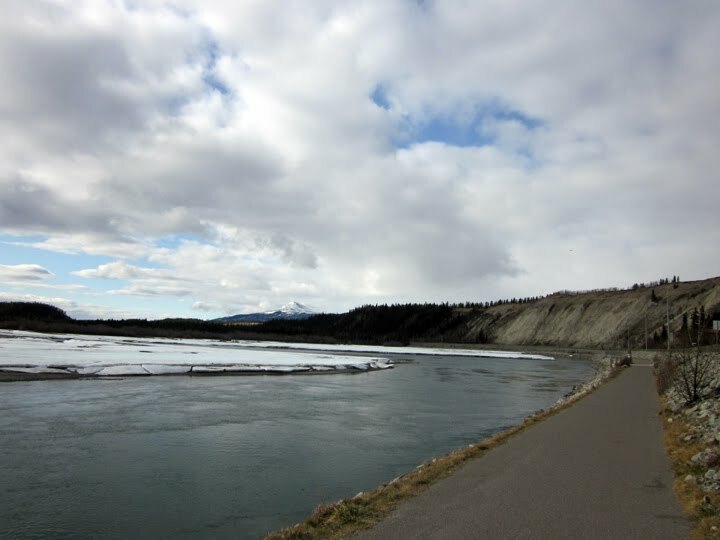 Though familiar to many residents of Whitehorse, this loop was brand new for me...a great discovery. I can't wait to run it again...Not today though....it is snowing and has been all morning. 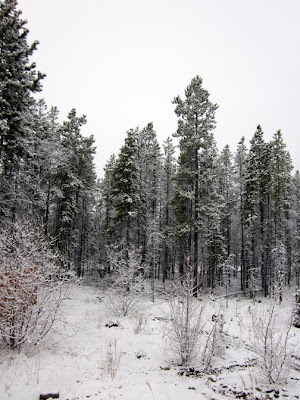 Here is the view out into the backyard when I awoke at 7am. As the days continue on here in Whitehorse I am continually struck by the constant quiet. In fact, when I awoke this morning I heard what I thought was the soft thud of a neighbour hammering next door. Upon listening closer I realized it was the beat of my own heart. for it is only in an atmosphere of quiet that true joy dare live." Beautiful words, beautiful images - beautiful silence. Thanks for taking us there. A daytrip to Alaska...Whitehorse to Skagway!